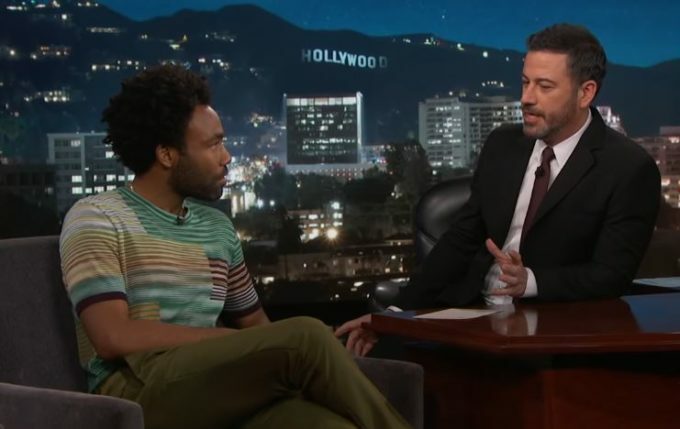 Childish Gambino stopped by Jimmy Kimmel Live last night to talk about his hit show Atlanta, Stevie Wonder, Lando Calrissian and his latest video ‘This is America‘ which is making waves. The politically charged clip has got everybody talking with various opinion pieces and analysis videos about hidden meanings inside it being published everyday. But Donald Glover has avoided all the attention so far, by choice. “Some friends have sent like a couple but to be real, I haven’t been on the internet since Thursday night before Saturday Night Live,” he said when Jimmy asked whether he’s seen all the reaction to the controversial clip. “I don’t want to be in the mix.. it’s bad for me. I’m really sensitive,” he told Kimmel with a smile. “I’ll just let it be.” If he’s saying he truth, he’s got great self control we must say. Glover also discussed performing with Stevie Wonder at his birthday party the night before, his role in the upcoming Solo: A Star Wars Story movie, the album he has listened to the most, and more. Watch it below.